Your Skin's Best Friend. With the use of pharmaceutical research, clinical testing, and dermatologist tests, Dermasil labs is dedicated to helping everyone's skin feeling better and looking healthier. In 1993 Chesebrough-Pond's USA (Unilever) introduced a remarkable hand and body lotion, Dermasil, to the therapeutic skin care market. Dermasil was developed as an Over-The-Counter pharmaceutical brand, providing a solution for people with dry to severely dry skin. Occlusives to block moisture loss form your skin's surface. Humectants to bind water in your skin's outer most layer. Lipids to enhance your skin's natural ability to retain moisture. EFAs which are an important component to your skin's moisture barrier. Dermasil Original transformed into the product you love today. 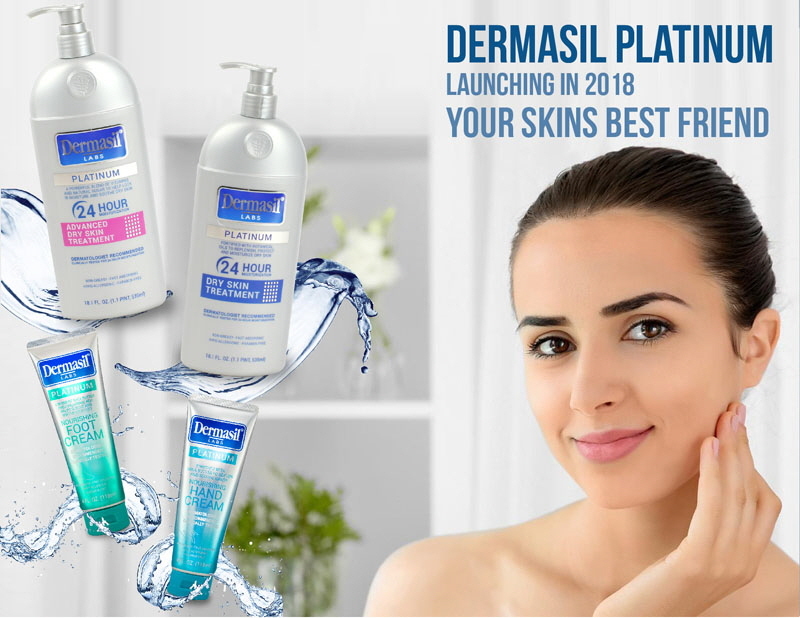 In 2018 we are proud to introduce Dermasil Platinum which provides 24 HOUR MOISTURIZATION. Using the Dermasil 4-System Method for Healthier Skin we have created NEW INNOVATIVE FORMULAE that contain NATURAL INGREDIENTS and VITAMINS, making it better than ever! All Dermasil Platinum products are Fast Absorbing, Non Greasy and Paraben Free, and are Clinically and Dermatologist Tested to continue our Mission to be YOUR SKIN’S BEST FRIEND.